Infant Price: Enter the price per Infant. 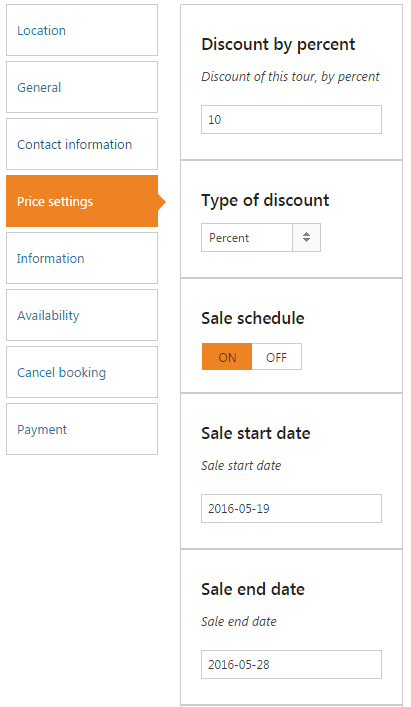 Disable adult booking: Turn ON to hide number of adult field in booking form, turn OFF to show. 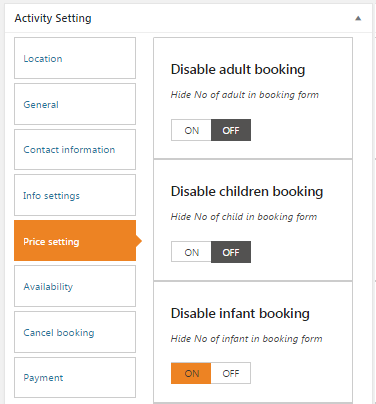 Disable child booking: Turn ON to hide number of child field in booking form, turn OFF to show. Disable infant booking: Turn ON to hide number of infant field in booking form, turn OFF to show. Sale Start Date: enter the starting date of sale for present Activity. Sale End Date: enter the ending date of sale for present Activity. Deposit payment options : Choose payment methods for deposit: percentage of Activity price, amount of deposit, no deposit. Depending on the Activity, you should choose an appropriate one.